By now the car almost made the familiar drive to Cluses by itself; after that we changed to a well prepared departmental road, with easy gradients. To avoid the chore of driving up to 1800m, possibly on chains and pay the parking premium. I was advised by my navigator to drive to Les Prodains, a car park with cable car access to the centre of Avoriaz village. The main down side of this plan was a long wait for the lift to cable car (20 minutes), then long wait for cable car (10 minutes), then a long ride to the top (10 minutes). Avoriaz now hires out SnowScoots and this year (2010-11) have opened up the lift system to them, which seems to have opened up the area to skibikes as well. 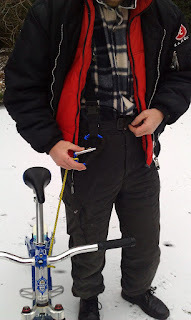 The main rule seems to be that you wear some form of leash between yourself and your skibike. Access is limited to certain facilities, which in practice means chair lifts only (of which there are plenty), life can be so cruel! 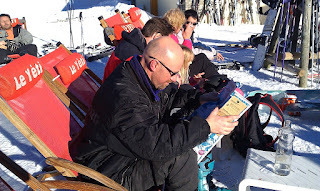 Note: I recommend you contact the resort and check for the latest information and mark up a copy of the piste map, so as not to get stranded without uplift. Eager to start getting some miles under my belt I used the Lac Intrets chairlift - to access the easy blue run of the same name as a warm up then on to the Aller de Chavanette/Retour de Chavanette roads to get back. Next I wanted to try the Stade run, but it was closed off, this didn't seem to bother most skiers, but I had to be on my best behaviour and followed a monster mogul field under chairlift which combined big icy bumps with killer gradients. I couldn't mess it up with an eager audience watching from the chairlift above, I got down OK, but not elegantly and at one point after an especially big bump wondered if I would be coughing up my testicles! In order to give the family jewels a rest, I used the Lac-Intrets chair to get me on to the excellent Blue d'Arare. I used the slow Plateau chair for a ride to the top of town for quick coffee in Le Yeti then followed the signs for Proclou to see what the other side of town had to offer. There were some pleasant, if gentle runs through the trees but their location made it dark and feeling later than it really was. So I headed back up and through town to Stade with the intention of following the Aller de Chavanette all the way to Chavanette. Irritatingly this route was now closed due to avalanche risk so it was back to Lac Intrets for a final long run. From the top of Les Haut Forts I skibiked down the Blue d'Arare then Crot back to the car park at Les Prodain, an awesome 1000m descent. The pistes were very bare of snow and I had to pick a line to the edge of the piste where possible to find some traction. Avoriaz has a unique location high on the cliffs edge, unlike other resorts which shiver in the frosty hollow of a valley floor, Avoriaz will have the longest, sunniest days when such benign conditions prevail. Conversely, in poor weather; such as blizzard / whiteout, it might be totally exposed and much like conditions in the Antarctic, or Scotland on a good day. Although accessible by road, it has been designed to be totally traffic free. People often complain about French resorts being "Supermarket skiing" that may be true of Avoriaz but that supermarket would lie somewhere between Marks & Spencer and Harrods in terms of quality.